As you may have heard, the President is giving a speech on jobs around Labor Day. 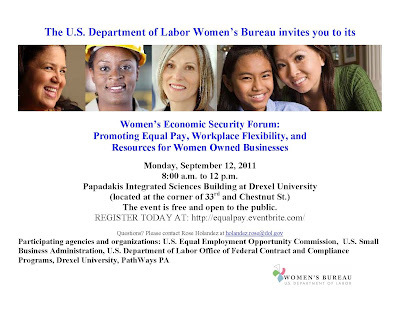 Please join national, state and community organizations across the country in urging him to address the employment issues faced by women. And share this plea with organizations in your networks and ask them to sign. Please visit the website to see the full text of the letter. authorized to sign such letters. National Coalition on Women Jobs and Job Training, National Organization for Women, Older Women’s Economic Security Task Force of the National Council of Women’s Organizations and Wider Opportunities for Women. 8:00 a.m. to 12 p.m.
Are You Ready for a Hurricane? Use these tips from FEMA and Ready.gov to prepare. From our friends at 9to5. Join PathWays PA and the Coalition for Healthy Families and Workplaces at our event today at Wired Beans Cafe to celebrate businesses who provide sick days for workers, and show your support for paid sick days! Join 9to5’s Day of Action on August 26! Celebrate Women’s Equality Day (when women won the right to vote in 1920) by joining the movement for Paid Sick Days. Here are some possible ways to get involved, we welcome your ideas! Hand out flyers or buttons at a community event, your PTA, neighborhood gathering or women’s centerHost a social gathering for friends and neighbors and collect Paid Sick Days petition signaturesSubmit your personal story of the benefits of having paid sick days or the impact of not having them. How to get started? Fill out the form below to receive an Action Packet of materials. Questions or suggestions? Contact Asha Leong, Day of Action Organizer, at Asha@9to5.org or call 1-818-277-4333. Shop Healthy. Eat Healthy. Stay Healthy: Support Businesses Whose Workers Earn Paid Sick Days. Crossposted from MomsRising.org as part of the #HERvotes blog carnival. This Women’s Equality Day, we plan to start spreading this message in Philadelphia through a new campaign to honor businesses that ensure all of their workers have an opportunity to earn paid sick days. What does women’s equality have to do with paid sick days? Well, many women end up in low-paying jobs with few opportunities to advance – or to earn sick days. Yet despite the constraints these jobs place, women still act as the primary caregivers in their families, sometimes finding themselves sandwiched between caring for their children and their parents at the same time. Have You Had Enough? I Know I Have! The passage of health reform brought many wonderful new protections and benefits for Americans. Unfortunately, for women, these protections and benefits came with a price tag. States now have the choice to either allow abortion coverage to be included in the state health exchange – with women having to pay for the coverage with a separate check – or states can exclude it from the exchange completely. Many states have already chosen not to include abortion coverage, forcing those who find themselves in need of an abortion also burdened with paying for the procedure out of pocket. This year, in Pennsylvania, an abortion ban in the state exchange was the Senate’s third order of business. While it moved quickly but hasn’t passed just yet, no other medical procedure was excluded from the exchanges in such a way. The White House has scheduled a special call this Friday to talk with people from Pennsylvania about the federal budget deficit/debt deal. The White House Office of Public Engagement welcomed our forwarding to you their message below. There will be an opportunity to ask questions. We hope you'll be able to join in, and hope you will ask a question and/or make a comment. (Tip: they often give instructions on how to ask a question right at the beginning; if so, follow the instruction right away, so you can get an early spot in the line for questions.) It would be very helpful for the White House officials on the call to be urged strongly to fight for what the country really needs - creating jobs and protecting low-income people NOW and emphasizing fair revenues and savings from reducing wasteful military spending for long-term deficit reduction. They should be asked what they plan to do in these areas. Support Businesses That Support Earned Sick Days! In Philadelphia, many businesses already give their workers an opportunity to earn paid sick days to care for themselves and their family members. On August 26, we will begin honoring those businesses by giving them the opportunity to be recognized for their actions. Please join us at Wired Beans Cafe at 12 noon on August 26, 2011, as we launch a decal campaign giving businesses an opportunity to show how much they want healthy customers and healthy staff. Wired Beans will be the first of many businesses to place our new decal in their window showing their support for paid sick days. We will be encouraging other businesses to come to show their support for sick days, and we will continue distributing these decals throughout the city. To develop employment opportunities for participants by networking and establishing relationships with the regional business community and matching customers to permanent, family-sustaining career-track jobs. This call will feature a discussion of effective communication strategies to promote breakfast in the classroom.And we’ve updated our school meals outreach materials to help you kick-off your back-to-school efforts. These materials can support advocates as they help schools expand outreach and make sure that collecting school meal applications is a top priority for the community. In the last session of the General Assembly a number of bills were put forward that would limit a women's access to an abortion. These bills put women's health at risk by limiting access and her choice. 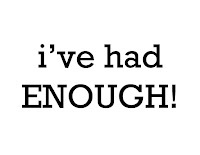 following the Campaign on Twitter @WeveHadEnoughPAliking the Campaign on Facebooksending a picture of yourself holding up a sign saying "I've Had Enough" or "We've Had Enough" to wevehadenoughcamp@gmail.com. They will include them on the website. EDUCATION /QUALIFICATIONS REQUIRED: Minimum Associates Degree from an Accredited College or University, including 30 credit hours in early childhood education, child development, special education, elementary education, or the Human Services field and three years of experience with children. EXPERIENCE REQUIRED: Experience in Preschool setting and knowledge of early childhood development. Willing to adapt to the goals and philosophies of our program and provide an environment that is non-punitive and strength based. Write curriculum for each age level as well as plan and implement daily lessons/activities. Coordinate the activities of the staff and aids in the Learning Center. Supervise all classrooms. Ensure health and safety standards are met within the learning center. The legislature remains in recess, but has been holding several public hearings ranging from Natural Gas to Child Labor. In addition, Pennsylvania slot machines hit a monthly record this July as $218.3 million dollars were collected in revenue. From our friends at Witnesses to Hunger. New data released yesterday by the Food Research and Action Center (FRAC) shows that a staggering 49.6percent of households with children in the first Congressional District served by Congressman Bob Brady reported not having enough money to buy food that they needed in 2008-2010. In the 2nd Congressional District served by Congressman Chaka Fattah, the food hardship rate among households with children was 32.2 percent. Across the state of Pennsylvania, one in five households with children experienced such hardship. See today's press coverage on the food hardship rates in Philadelphia in the Philadelphia Inquirer by Alfred Lubrano and the Daily News by Carol Towarnicky. According to the article "No Place for these Students to Call Home" by Eric G. Stark from the Sunday News, the number of homeless students in Lancaster County has risen dramatically within the past few years. In fact, the article states that there are more than 700 suburban families who are considered homeless living within Lancaster County. Homeless students face several barriers including excessive stress and depression, and often fall behind their classmates in school because they do not have access to technology necessary to complete assignments. It is clear that homelessness is not only an urban problem. The Office of Child Development and Early Learning (OCDEL) issued a Request for Information (RFI) today regarding the Child Care Information Services (CCIS) grants for Fiscal Year 12-13. This Request for Information offers the public and early childhood community an opportunity to provide comments and recommendations that will be considered when drafting the final RFP. An RFI’s purpose is to solicit feedback on ideas, not to solicit bids. To expand the capacity of VITA partners across the country, NCTC is working hard this year to authorize the VITA Act of 2011, and local outreach in your Congressional district is a key part of the strategy. NCTC is asking our community partners to discuss the impact of VITA programs and the importance of refundable tax credits in promoting economic advancement for working Americans with their member of Congress during the August Congressional Recess (August 8-September 5). You can also ask the member of Congress to co-sponsor the VITA Act of 2011 (S.816 in the U.S. Senate or H.R. 2151 in the U.S. House of Representatives). According to a new report by the Children's Defense Fund, The State of America's Children, the percentage of children living in poverty showed a dramatic increase between the years of 2008 and 2009. Child poverty increased by nearly 10%, amounting to the largest increase in a single year since data has been collected. Between 2000 and 2009, child poverty increased 28%, a distressing change in direction from the 27% drop in poverty levels that occurred between 1992 and 2000. In 2009, 15.5 million, or one out of every 5 children lived in poverty, defined as having an annual income of less than $22,050 for a family of four. Nearly half of these children live in extreme poverty, with an annual income of less than $11,025 for a family of four. Today Congress passed and the President signed the Budget Control Act of 2011. The bill calls for up to $2.4 trillion in savings over the next decade, raises the debt ceiling through the end of 2012 and establishes a special Congressional Committee to recommend long-term fiscal reforms. The debt will be increased in two phases. The first phase includes cutting $917 billion in spending over 10 years and it would raise the debt ceiling by $900 billion. These cuts are to be future spending caps but it is not clear which agencies will have their funding limited. Where the cuts are made will be up to Congress. Today, both chambers of Congress are likely vote on a debt ceiling compromise – one that will lift the ceiling through the end of 2012. Accordingto the plan overall there will be $2.4 trillion in budget cuts over the next decade and special commission will be created to find more cost-cutting measures. There are no revenue items in the deal. It is unclear where exactly where these cuts will be made, however, for now, government programs like Medicare, Medicaid and Social Security are exempt from the budget cuts. Other programs like Women Infants and Children, Head Start, and LIHEAP are not immune. Formore information about this deal please click here. Also be sure totell your legislator how you feel about this plan.